Looking for a place to relax and unwind? Head to Mammoth Lake's area hot springs to enjoy scenic alpine views as you relax in the warm spring water. Buckeye Hot Springs treats visitors to two pools and is situated next to a tranquil mountain stream. Visitors come to Travertine Hot Spring to enjoy expansive views of the Sierras as they soak in 103 degree water. Crowley Hot Spring boasta a large pool as well as a more intimate soaking tub. Mammoth Lakes scenic hot springs provide ideal locations for a relaxing soak. 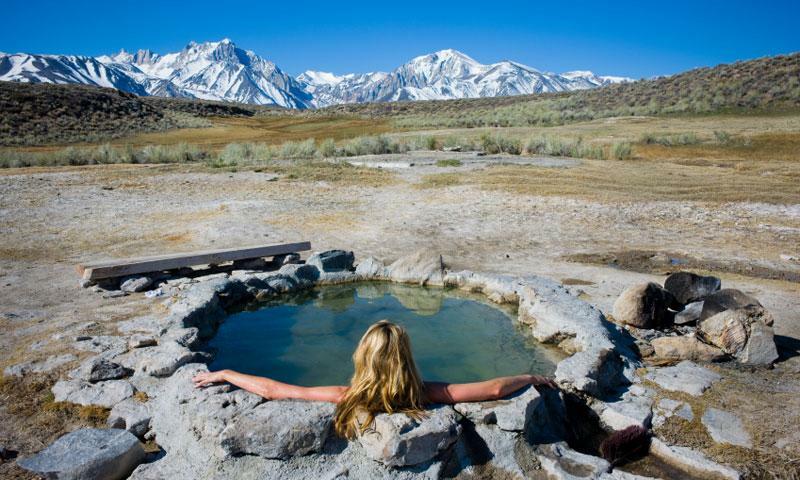 Most hot springs in the Mammoth Lakes area are primitive and have no developed facilities. There are no costs to visit any of the listed hot springs. This spring, located about 14 miles south of Mammoth Lakes, has a large pool as well as a smaller tub. The pool generally hovers around 95 degrees while the tub generally stays at 105. Location & Seasons: This tub is best visited in spring, summer, or fall, as winter snows may make the road impassable. To find the spring, head south of Mammoth on US-395 for 9 miles, then turn left on Benton Crossing Road. Follow this road for 3.1 miles. As you cross over a cattle guard, find a small dirt road on your right, turn here. Continue on this road for 1.2 miles to the parking lot. The stunning mountain views from this cement tub are superb. It can seat about 8 people and it's easy to find. Location and Seasons: Accessible any time of year. Follow the directions to Crowley Hot Springs, but instead of turning right after the cattle guard, continue down a small hill and turn left. The road will split after a quarter mile and take the right fork. You'll see logs that designate a parking area. Park here and walk the remaining couple hundred feet to the springs. Another favorite and nearby hot spring, the Hot Tub is probably the most popular. Location & Seasons: From Mammoth, head south on US 395 for 9 miles and turn left onto Benton Crossing Road. Turn left onto Whitmore Tubs Road and follow for about a mile to the second dirt road on the right. Turn right and you'll run right into the springs. Soak in 103 degree water while taking in expansive views of the Sierra’s. Location & Seasons: Travertine Hot Spring is located just south of the town of Bridgeport on California State Park land. From Mammoth Lakes head north on US-395 for about 50 miles, then turn right on Jack Sawyer Road. Follow this dirt road for about a mile to reach the spring. Access is limited during winter when snow may make the road impassable. Activities: When you’re finished soaking, bed down at camp sites located nearby. Camping is not allowed in the hot springs area. This spring boasts two soaking pools next to a clear mountain stream. The water here generally hovers around 100 degrees. Activities: For those wanting stay in close proximity to the spring, there is a primitive Forest Service campground located about one mile away. Location & Seasons: For most, spring, summer and fall are the best seasons to visit as winter snows make the roads impassable. Hearty souls can cross-country ski to the spring in winter. To find the spring from Mammoth Lakes, head 51 miles north on US-395 to Bridgeport. From Bridgeport, turn left on Twin Lakes Road in the north end of town. Follow this road for 7.1 miles to Doc and Al’s resort, where you turn right on dirt Forest Service Road 017. Follow signs to Buckeye Creek. After 2.5 miles find a large flat parking area. Leave the car here, and follow the creek about 100 yards downstream to the spring.